Siberia … just the thought is intimidating … particularly in winter time. Imagine attempting to ride a tadpole trike across frozen Lake Baikal some 700 or so kilometers (approximately 435 miles) with average temps around 14 degrees F (-10 C) and snow storms where the temperatures plummet down to about -22 degrees F (-30 C). Then there are the terrifying earthquakes which frequent the area. In short, it is no picnic. Lake Baikal is the largest (by volume) freshwater lake in the world, containing roughly 20% of the world’s unfrozen surface fresh water. With a maximum depth of 1,642 m (5,387 ft), Baikal is the world’s deepest lake. By surface area it is the 7th largest lake in the world. It contains more water than all the North American Great Lakes combined. It is located in southern Siberia. Honza “Jan” Zdansky is Azub’s main test rider of their prototype FAT-Tris trike and made the attempt to cross the frozen lake against such impossible odds. He found himself walking much more than he did riding. Here he is riding down onto the frozen surface of the lake at the start of his journey. He started out riding, but he found himself doing more walking than riding as his journey progressed ever so slowly it was quite challenging. He found that he was not able to ride across/thru much of the surface of the frozen lake. He had no choice but to pull, push, lift and just plain struggle and wrestle with the trike to move it forward across the frozen lake’s surface. Sometimes it was impossible to pull the trike and he had to push and steer the trike which, of course, is even more tiring. Having to do this so much of the time was taking its toll on him and requiring periods of rest trying to recuperate. He also lifted it numerous times to sit it back upright after it tipped over several times from being loaded down and quite top heavy causing it tip over readily especially when he was not seated on it to help hold it down. Out there for several days all by himself he had to carry quite a bit of equipment and supplies some of which were loaded up high on the trike resulting in a high center of gravity. In this picture below the trike just tipped over all by itself when he let go of it while it was sitting on an uneven surface. Here is a look at some of the all too typical surface he was dealing with. Several times he dealt with serious and scary dangers. Eventually earthquakes brought his attempt to cross the lake to an end. Most of the videos have English subtitles which can be read. If they do not appear you may have to turn them on. Brrrr! I am cold just looking at this picture. If it were a Catrike he could say “Here Kitty Kitty”. He had to deal with crevices in the ice which, of course, are always dangerous. As you can see he had to lift the trike up and literally throw it across. And some of them he chose not to attempt to cross over as the ice was bad and unstable. Consequently he was forced to go way around them adding considerable distance and frustration to his expedition … not to mention further exhaustion. When this occurred he lost an entire day and spent the day absolutely tiring himself for nothing. It took its toll on his mental and emotional condition. Each and every day was physically exhausting as he struggled to make headway. Several times he found he could no longer go further where he was at and had to turn back to find another way. He often fell down in his struggle trying to move the trike along, but occasionally he did get to ride the trike. However, even when he could ride he still had to get off the trike to check out the surface to figure out which is the best and safest path to take. But not nearly as much as he would have liked. Just looking at some of the areas where he was pushing or pulling the trike it looks like it would not have been a problem riding it, but I wasn’t there so I have to believe that there were always reasons why he was not riding at the particular point in time. Perhaps some of it was simply a matter of the immediate danger where he was at and the need to be able to see and react standing up on foot rather than being seated on the trike. I have no idea. I am just guessing concerning this. I know in just the off road riding I have done I have some times found myself getting into places and situations where the going got very difficult and I had to get off and push, pull, lift, carry, etc. and sometimes regretting I did whatever I did to get myself into that situation/predicament. I can only assume that this last picture I am sharing here was taken early on since it appears to be an expression of joy and triumph. With the attempt ending in having to give up I would not think that this picture was taken at the end. I recently came across this website about accident prevention dealing with cars and bicycles. I thought you might find it interesting and perhaps even helpful. 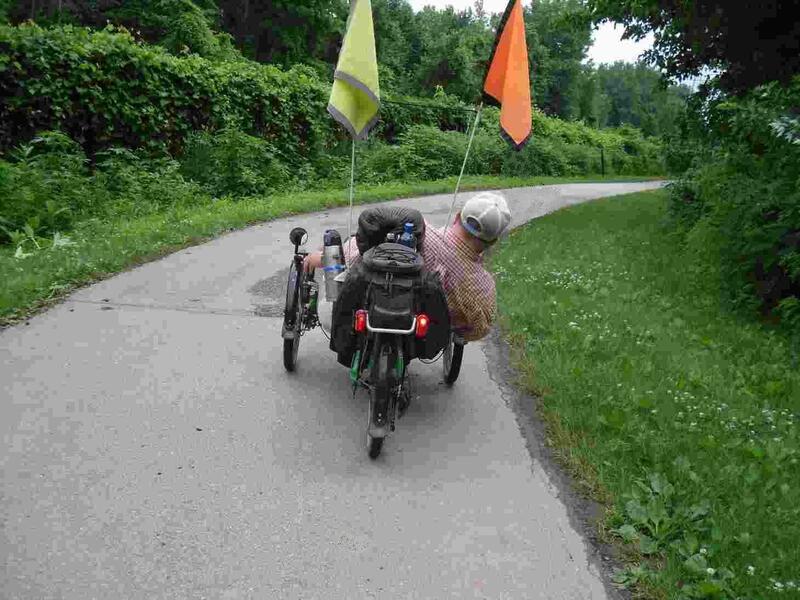 I thought I might throw in this “Why Ride A Recumbent Trike?” here. And here is their Trike FAQ. This website is also Australian. Onboard electric drives are not the only means available to assist riders in their pedaling. The Ridekick has been around for awhile and the Brouhaha trailer attempted to make it to market, but was unsuccessful in their Kickstarter campaign. Now this new comer, Wheezy, is trying to make it to market. The key word there is “trying” as this has also been in the Kickstarter campaign. According to their Kickstarter page it has been cancelled as of Oct. 24th. I am not sure what that means as far as whether or not the product will ever make it to market. “Wheezy turns any bike into an e-bike in a click. No special adjustments necessary simply connect Wheezy to your existing wheel and you’re good to go! Originally the company hoped to start shipping this product by the middle of next May. I don’t know where things stand now since the Kickstarter campaign did not go well. They offered lower prices ($400, $490 & $740) on the product to backers, but didn’t get much response. All I can say is … if those are lower prices I would hate to see what their normal price will be. I think those prices are plenty high. Wheezy is an electric auxiliary all-terrain wheel. It operates on a brushless wheel hub motor that is entirely enclosed, protected from erosion. This means high efficiency, reliability, no noise, no maintenance and a long lifetime. Wheezy runs on a small lightweight NiMH battery pack used for hybrid vehicles. NiMH is much safer and lasts longer than the lithium (Li-ion) batteries used for standard e-bikes. It comes with a smart microcontroller, creating for smooth operation and utmost battery efficiency. 1) Replace the left rear wheel nut. 2) Add install Pedal Assist Systems (PAS) or Hand Throttles. 3) Connect Wheezy. The Wheezy unit weighs about 26 pounds (12 kg). It can be wheeled easily using the tongue to hold onto so that it doesn’t have to be carried. A key-based power switch and battery lock system adds security. The unit can be operated as a pedal assist system or manually with a thumb throttle. Obviously this is designed for a bicycle. However, with some adaptive ingenuity I would rather imagine that it could be made to work on a tadpole trike. Of course, first it would have to come to market. We’ll see what happens. Another FAT trike has made its appearance. With the popularity of fat trikes more manufacturers are coming out with their particular offering. This time it is Tri-Sled and they are calling their fat trike “Gizmo Phat”. That seems like a rather strange name, but hey, who cares. I guess in the scheme of things it matters not. I think it is a nice looking trike. Tri-Sled is an Australian manufacturer. Their “flagship” model is called Gizmo and so they continued with that name as part of the model name on a couple of other models they also offer. Did you follow that? Oh, never mind … it is not important. As is often the case there is not much information available concerning this new model at this time. It does look interesting as the width of the trike has purposely been kept minimal so that it will fit thru small openings where many trikes could not go. HERE is TriSled’s website. HERE is TriSled’s Facebook page. At the time I am composing this article I do not find any mention of this new model on their website, but it is shown (just announced) on their Facebook page. As you can see it has a rear disc brake as well as the ones on the front wheels. It will be interesting to see what happens as time passes. The FAT trike scene is getting more and more interesting all the time. If you have a hankerin’ for a FAT TRIKE and don’t have (or want) to spend $8000 for one there is good news. Trident is now offering their 20 inch TERRAIN model for an amazingly low price of $1399 (plus $125 shipping). The Terrain is available as either a 3 x 20″ or a 3 x 26″. The 26 inch model sells for $100 more. And the Terrain model even folds so that is a plus for those who have space issues for hauling or storing. It makes perfect sense not to invest a small fortune into a trike that one intends to use in a way that will likely be hard on the trike … namely off road use. Visit the Trident website for more information and details. It has been windy in much of the United States recently. With the wind and the wind chill factor not many cyclists (or others) have been seen venturing out. I went out this morning and rode on a local trail. I saw one other cyclist the whole time I was out. It has to be a very strong wind to bother me and keep me from riding. I suppose if I were riding a bicycle or even a tadpole trike with the seat angle much more upright than my Catrike Trail is I would notice the wind a lot more and it would be a problem for me. However, I am thankful for my “recumbent” (laid back, reclined) riding position as the wind just is not an issue for me. I jokingly say “what wind?” when someone I am riding with objects to (or complains about) it. Although I am saying it just to tease them and give them a hard time I can honestly say that I am serious at the same time. Yep, ‘what wind’ is my come back and I am so glad I can say it. It has to be either rather cold so that the wind has a noticeable wind chill factor or it has to be blowing hard enough to get my attention … say about 30 mph or higher. Sometimes I think it would be neat to take advantage of the wind by using a sail on a trike. There are people who do it. There are a couple of manufacturers offering sails on trikes although it is more common to see them on a delta trike than on a tadpole trike. There are even para-sails used as well as kites. There is only one problem I foresee in this … one would have to admit that there is a wind. 🙂 That would take a lot of fun away for me. Besides that, I would probably lose control in a heartbeat and crash and burn. I spent 8 years in the U.S. Navy, but that didn’t make me a sailor as far as knowing anything about sailing a sail boat. Sorry, but this just doesn’t look like it would be much fun to me. It looks like it would be very tiring … quite literally exhausting on the arms and upper body dealing with pulling on the rig almost constantly. And getting tipped over while travelling along at a pretty good clip sure isn’t appealing. I think I would rather just pedal along. Of course, I don’t think I would have any desire to ride in such a desolate miserable looking area as that anyway. (Different strokes for different folks.) For those who have an interest in this 3100 mile (5000 km) kite-powered trike journey thru Russia, Mongolia and China you can visit the website HERE, the blog HERE, his Facebook page HERE and check out more of his videos HERE. Occasionally someone asks me about my homemade safety flags wanting information on how to make them. I am not a seamstress so I had a woman make them for me. Before I get into this I want to say that there are lots of factory manufactured safety flags available to buy. I am strongly opinionated about them as some are better than others and some are not of much value as far as making a rider safer. Some are pretty much worthless. I have had several factory made flags in an attempt of making myself visible and thereby safer. I finally decided to make my own and I really like the flags I have now as I know they work great as far as being seen. The flags themselves are about 15 inches square and the black border is a 2 inch (or more … more is better) wide black satin double sided finish ribbon trim. It is okay to make the flags larger than 15 inches, but I would not make them any smaller. They could also be rectangular rather than square although I personally prefer square. I highly recommend using this black satin finish color as trim around the outside of the flags as it really makes the flags stand out and “catches the eye”. The black trim is available at a well stocked fabric shop as is the safety yellow and safety orange (also known as florescent yellow and orange) nylon material. The black satin trim is folded over the flag material as well as folded over itself so that it is thicker and offers more strength and protection to keep the edge of the flag material and itself from fraying in the wind. Just a reminder — you can left click on any image in a WordPress blog and have it open up in its own window. Oftentimes it is much larger so you can see it in much greater detail. When you are finished viewing it just use your browser’s BACK button to close it and return to this page. The top end of the flag where the pole slides in must be sewn closed, of course, so that it doesn’t allow the flag to slide on down the flag pole. It is important to have sufficient sewing so that it holds in wind and flapping around. Here is a drawing I made to show how the black satin finish ribbon is folded over and sewn onto the flag. The orange is the flag material and the green is the thread where it is sewn. I provided a short piece of a fiberglass flag pole (20 inches or so) to the seamstress to use to “fit” the flag to so that it is a pretty snug fit. That is important as it is hard to keep the flag on a flag pole if it fits loosely. Even with a snug fit I also use plastic cable ties on the flag to help secure it in place on the pole as otherwise they will work their way up off of the pole and if you didn’t notice it in time you could lose the flag. In addition to making the flag fit snugly on the flag pole I also use 3 small size plastic cable ties (top, middle and bottom) and cut small openings thru the flag material up near the pole so I can insert the cable ties thru the flag and around the pole … tightening the cable ties around the flag pole to keep the flag from moving up the pole. When I say “cut holes” I actually used an awl and punched small holes thru the flag material. If you ride after dark you may want to use a reflective border on one of the flags as it will really stand out when light shines on it. I did this for awhile, but I finally went with the black border on both flags as I rarely ride after dark and the black border shows up much better in the daytime. If the flags are constructed like this they should last quite some time. The material will fade some out in the sun as time passes so I would advise changing them periodically so that they offer maximum visibility and protection. The height of my flag poles are 65 inches from the ground to the top of the poles. In my opinion this is an ideal height. Too low or too high greatly reduces the effectiveness as far as attracting attention to the flags. “Why do people ride recumbent bikes and trikes? 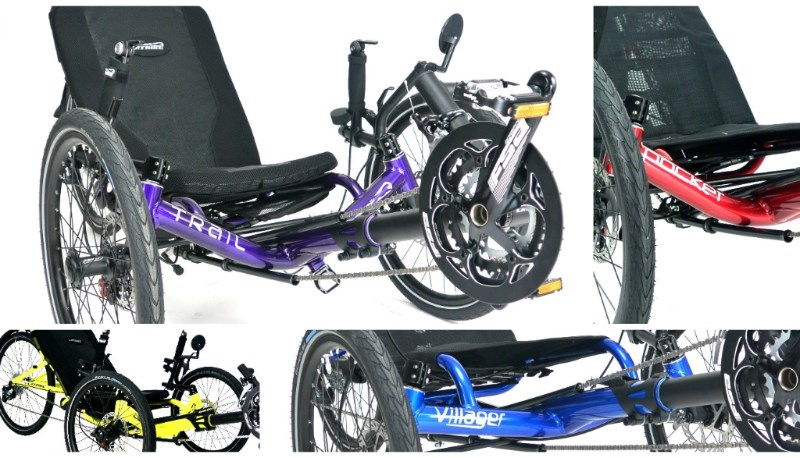 One of the biggest reasons is the comfortable riding position of recumbents that avoids the well-known discomforts and pains of traditional diamond frame bicycles. In this video, recumbent riders explain why they made the switch to recumbents and love their new ride. This video is part of a series of videos sponsored by both Catrike and Easy Street Recumbents of Austin, Texas. We are grateful for their support. The interviews are mostly culled from several hours of interview footage collected at the 2015 Heart of Texas Recumbent Rally. The unexpected weekend Texas freeze cancelled all of the riding events this year, so we all had to make do with visiting, eating, and drinking in Austin. Everyone I talked to said they had a great time! But this also left a lot of time for interviews, so it was fortunate that Phil Allen and I had come down on Thursday with his lighting, mikes, backgrounds, and camera equipment for the interview setup. My wife, Patti, tried to come down on Friday morning and the highways from Dallas to Austin were closed! Phil Allen is a professional videographer and editor, with (among other awards and accolades) a Texas Emmy under his belt for the documentary “A Fair To Remember” about the history of the Texas State Fair. I have been filming Catrike and HOT Recumbent Rallies since about 2010, and started editing and posting them just for fun. I have also been collecting video footage at various riding events since 2010 (sometimes riding with 2 or 3 cameras going) and that archive has come in handy for this project. After the first HOT Rally video posted, Mike Librik (Easy Street Recumbents owner) asked me to keep doing it each year. Mike kept wanting more interview footage, and I finally got him to bring in professional help from Phil in 2015. While I have spent many weekends planning out these videos and editing them together from the hours of interviews and years of riding video archive, I could not have put this together as well without Phil’s guidance and insights. Phil and I have known each other since our kids started in school together in 1999. This is the first video project we have been able to work on together and I am very happy with the results. I hope you are too. HERE are other videos posted on YouTube by Steve Erickson. Today is Veterans Day and I don’t want to let it pass by without posting something about it. As an eight year military veteran myself I know the sacrifices involved in serving in the military. I appreciate those who serve and want to say thanks for their service. I am a firm believer in “giving honor to whom honor is due” and so I salute my fellow veterans. Yeah, that was me at about 18 years old. I was looking down at a young child who was also wearing a navy uniform of sorts and we were saluting each other. I have often thought about how neat it would be to have military veterans riding together in a Veterans Day parade with each former serviceman flying the flag of their particular branch of the military. ForgottenNotGone.ORG is dedicated to helping save veterans and their families from the destruction of suicide. Feeling alone,forgotten and abandoned, causes 22 veterans a day to take their own lives in the United States. 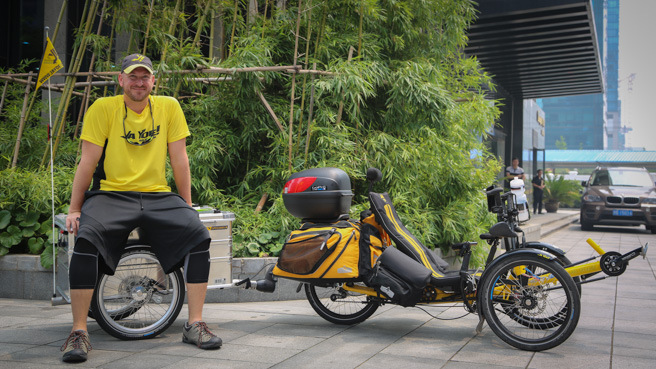 I am sure many of us know about Matt Galat’s amazing trike journey that is underway once again … starting over after his first attempt ended unexpectedly while still in China thanks to a big truck hitting him resulting in a broken bone in his left shoulder. Matt is all healed up now and re-outfitted even better than before. Here is a picture of Matt with his new rig. He calls his endeavor JaYoe. JaYoe! is a Chinese phrase meaning “add fuel”. Matt has many great videos he has already created and now he offers a podcast to listen to. The JaYoe Nation Podcast follows Matt as he makes his way from China all the way to USA on the seat of his recumbent trike. This podcast gives you a chance to see the in’s and out’s of what goes into traveling around the world. Learn about the places, people, and cultures as well as the gear and personal journey’s that take place during a tour like this. Here is one of Matt’s most recent videos … laughingly entitled “REBOOT”. That pretty much sums up what is going on concerning his world journey. The JaYoe Travelogues follow Matt as he rides his trike from China to USA … through 100 countries as he ventures and captures what he is ‘seeing, doing and meeting’ along the way. I don’t know if it is an oversight or what, but I find it disturbing that sailors and airmen are not mentioned (included) … only soldiers and Marines. Anyway, I think you will find this a moving video presentation. My sincerest heartfelt thank you to all who have served/are serving in our nation’s military. A few years ago I went with three cycling friends to a “rails to trails” trail we had never been to. It ran north and south. We started about in the middle and headed north first. As we were riding along we all noticed and talked about the fact that we seemed to be riding uphill pretty much constantly since we started. We went on to talk about how it would be a relief and delight when we got to the north end and turned around heading back south … as it would be downhill all that distance. We were in for a surprise and to this day can’t explain it. Upon turning around and heading south it seemed like we had the same uphill ride. 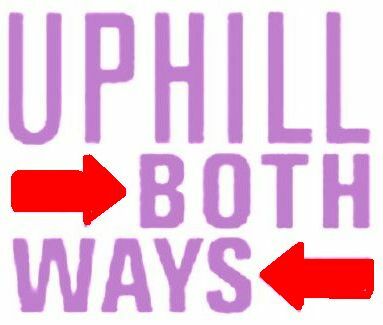 Another thing that I have experienced several times is a headwind to ride into regardless of which direction I am riding … including turning around and heading back in the opposite direction. I know the wind can change direction, but as far as I know it didn’t. I have no explanation for it. Oh well, at least it didn’t happen when I was a kid walking to school and I never had to walk in the snow barefoot. So has anyone else experienced such strange happenings? Now is your chance to come out with it … or are you concerned that someone might think you are a bit shy of a full load? So if you have been considering purchasing a new Catrike you might want to take advantage of this factory promotion. Just contact the nearest Catrike dealer. Locate a dealer HERE. It can happen all to easily and so fast you can’t do anything to stop it. We may think we are safe because we have 3 wheels under us instead of just 2, but it just ain’t so. A tadpole trike can and will tip over quite easily. There are various factors which come into play that affect the stability of a trike. Two main things come to mind … 1) the center of gravity, and 2) the front wheel width (the distance the front wheels are apart). As to center of gravity the lower the seat is the lower the center of gravity is. Trikes with high seats are not nearly as stable as a trike with a low seat. Also carrying weight up high on the trike such as in panniers and worse yet … on top of a rear rack (luggage carrier rack) raises the center of gravity considerably. The higher the center of gravity to more easily a trike will tip over. It is best to keep the weight down as close to the ground as you can when loading it up with whatever you are hauling on it. If you have to haul stuff up high on a trike you should try to place only lightweight stuff up there. The distance between the front wheels affects stability big time. The wider apart the front wheels are the more stable a trike is … the harder it is to tip it over. A narrow track trike will tip over fairly easy. Leaning into a sharp turn especially at speed helps reduce the likelihood of a tip over. Another factor is weight distribution. 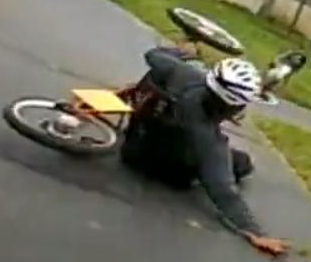 A trike that has a seat which adjusts forwards and backwards on the frame can be a problem as moving the riders weight forward and back along the frame affects handling. Here is a video showing a tip over. This rider was very fortunate as this could have resulted in disaster. I have stopped this video numerous times trying to analyze what happened. 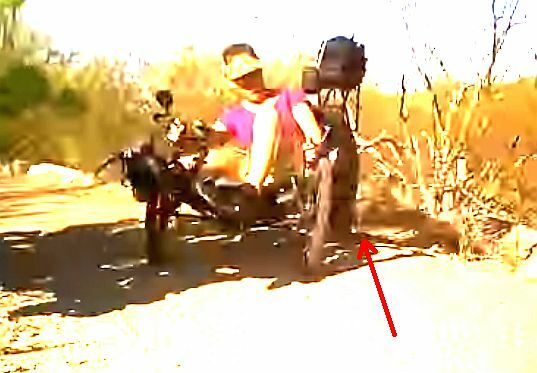 It is rather difficult to see it as it is dark, but I am pretty sure that as the trike went into a sideways skid the rear wheel “caught” on a small rock or uneven ground and caused the tip over. 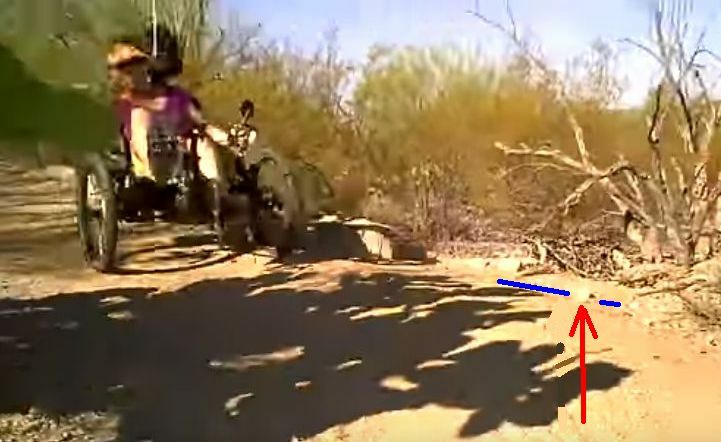 Here are a couple of pictures in which I have placed red arrows pointing to the place where the rear tire slides around and catches on something. Where I have drawn the blue line also looks to be an unevenness in the surface of the dirt. This by itself could have been the cause of the tip over. It doesn’t take much to cause a tire to “catch” and tip the trike over. Even though I can not pin point the exact cause of this tip over you have to admit that it happened quickly and once it started there was really nothing more she could have done to prevent it. She was doing the right thing as far as steering with the skid to control it. It was just a bad place for the skid to be occurring. Here is another video showing a tip over taking place. Again, it happens so quickly. I too have experienced tipping over more than once. One time while picking up trash along a local trail I was sitting still along an embankment I was reaching over toward the embankment to pick up some trash when my trike started to tip over. I tried to reach down to the ground with my hand to stop it, but I couldn’t and I not only tipped over, but I rolled on over partially down the embankment with my trike following after me and right on top of me pinning me down. It was a bit challenging to get out from under my trike and get myself back up to the top of the level ground up above. It happened right along the side of a busy road.I didn’t get hurt, but I sure was embarrassed. Fortunately my injuries have been few and minor. Obviously one can get seriously injured or even killed. 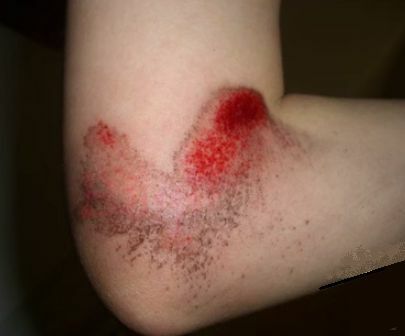 Road rashes are quite common and they, of course, are painful. OUCH! That hurts just looking at it. Here is a video from the land ‘downunder’ (Australia) sharing about tadpole trikes as an informational and promotional video. Special acknowledgement and appreciation goes to fellow tadpole rider, Glen Aldridge, for posting the video on Facebook.